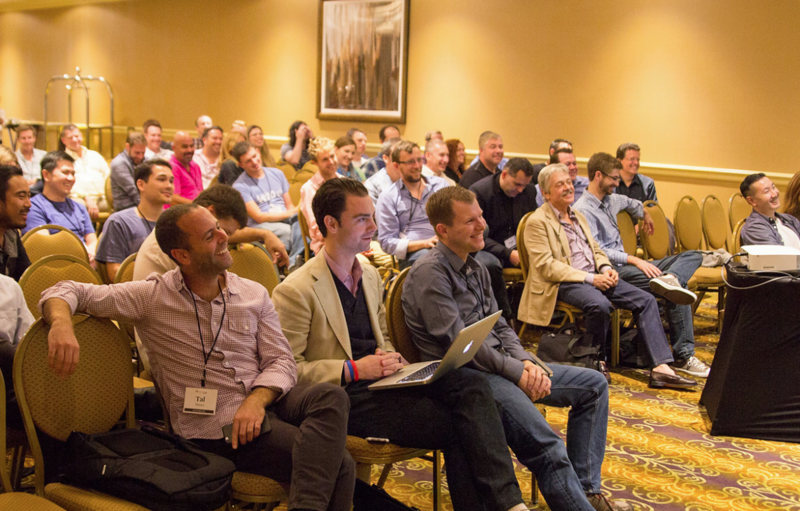 Top eCommerce Conferences of 2017: Don't Miss These Events! There are tons of conferences being offered in the world of eCommerce and marketing today, so it can be difficult to choose which one is the best fit for your individual situation. We’re a bit biased when it comes to talking up our favorite eCommerce conference (eCommerceFuelLive of course), but there are a lot of other great options out there as well. Whether you are a big store or looking into selling on Amazon, we break down the biggest and best eCommerce conferences to help you make the best choice for your business and growth. Andrew: Welcome to the eCommerceFuel podcast, the show dedicated to helping high six and seven figure entrepreneurs build amazing online companies and incredible lives. I’m your host and fellow e-commerce entrepreneur, Andrew Youderian. Andrew: Hey guys, it’s Andrew here and welcome to the eCommerceFuel podcast. Thanks so much for tuning in today. Today on the show, we want to talk specifically about events, conferences. There’s a ton of different conferences in e-commerce and also just in the online space in general that you can go to. Which ones should be on your radar? Which ones make sense to attend? We want to do a round-up for you and talk about our personal experiences. Joining me to talk about it is a man who’s become quite the hot commodity on the conference ticket recently, Mr. Drew Sanocki. Drew, welcome, sir. Drew: Hello, Andrew. How are you doing? Drew: All the big ones. All the big ones. Andrew: Yeah, man. What’s the secret to becoming a much-desired name out there? Drew: There’s no secret, Andrew. It really is just…it started when I was a kid and just, this was the goal. To speak at ECF Live. Andrew: Are you going to be putting out a course, in addition to your fantastic analytics work, on…. Drew: How to get an amazing speaking gigs? Andrew: Or just how to generate raw charisma, how to develop that. That could be useful. Drew: The great thing about all these is that they make me a ton of money. Speaking fees. A speaking gig can give you, what? Like 10, 20K per gig. Andrew: It can. Is that where you landed on these? Drew: That’s what I plan to ask for, for the next ECF Live. Andrew: Nice, nice. Well, we’ll see what we can do there. We’ll negotiate offline. Drew: Or a free dinner. Andrew: Or free dinner. Free dinner, yeah. We’ll land on one of those two, I promise. How are things over at nerdmarketing.com? Drew: We are doing great over at nerdmarketing.com. We’re holding down the fort. Keeping the site up. We’re in month three now of operation, so it’s been a good three months. Andrew: Nice and the podcast has been great so far. I know I’ve mentioned it, but nerdmarketing.com, the podcast that you’ve been putting out every week, some really good stuff. Drew: Thanks. Yeah, being on this podcast really helped me get used to talking into a mic. So thank you, Andrew. I owe my podcast to you and I love it. The podcast approach has been great for me, because back when I was trying to write long-form blog posts, they were just killing me. They would take me down for a week and I usually was happy with the final result, but I just couldn’t do it because I’d have to make it my full-time job and it wasn’t paying me any money. So it was a labor of love and the podcast has just enabled me to get stuff out there easier. Andrew: We’ll have to…we were talking about this…hopefully we can bring maybe one of your episodes onto this show in the future. But if you’re not listening, really good stuff. Check it out on iTunes or over at nerdmarketing.com. It’s hard to get enough Drew, so check it out. Drew, we’ve got a ton of events here to go through. What do you say we jump in? Andrew: Drew, so I’ve organized conferences and events in kind of three categories, three buckets. First, events that might be really applicable for independent store owners, people that aren’t 800-pound gorillas in the space. You know, high six, seven and maybe even eight, low eight-figure store owners and merchants. Then secondly events that are not e-commerce specific, but really interesting potentially applicable events in terms of online marketing. Then finally some of the big enterprise conferences that I wanted to mention as well. The first one I’ve got on there is IRCE. This is the Internet Retailer Conference. Arguably the biggest event in e-commerce every year. Happens in June. I think it’s June 7th through 10th in Chicago this year. I went last year. It was interesting. It was definitely focused on…this maybe should have been in the enterprise bucket…but definitely focused on larger, bigger stores. But the nice thing about going is you can network with a lot of people, even smaller store owners and there’s an enormous vendor floor which I found most valuable, where just about everybody online is and you can walk the floor and connect with people, learn about new products, connect with your existing vendors, which is pretty cool. Drew: Yeah, I think they caught on to the fact that that vendor floor was popular because they started charging more for it. Used to be you could go free and just walk the floor, because the whole conference is kind of expensive, so I always liked to just pay for the floor access, which is the cheapest, and just kind of walk the floor and connect. But I agree with you, it’s sort of a borderline enterprise conference. All the big retail brands are there and the talks they give are much more applicable to a big organization. You see a lot of VIPs in marketing and VIPs of e-commerce in the seats and the topics are like, how to Track omnichannel metrics across in-store purchase in your catalog and your website…stuff like that that for the typical eCommerceFuel listener is not as relevant. But that said, I wish I had gone to IRCE back when I was running my small retailer and the reason is because you meet a lot of people who might ultimately buy your company. So Wayfair’s there. All the bigger e-commerce players are there. It never hurts to meet them and meet the investors who buy small companies, too. So that’s what I get out of it. I have not attended it, but I would probably make the trip at least once because it’s all of Magento’s ecosystems coming together for their flagship event. It looks interesting and it sounds like its pretty well-produced as well, from what I’ve seen. Do you have any experience with it, Drew? Drew: I’ve never gone. I just know that there was Shopify Magento, Shopify’s blog was all this value add stuff about e-commerce and all Magento ever published on their blog was what conference they were attending and what booth they were going to be in. [laughter] Then they were just talking about Imagine for half the year, so I imagine it’s pretty good. Andrew: Next one. Flipping from Magento to Shopify. Shopify Unite, it happened this year, I think March 22nd and 23rd. I had the chance to attend it this year. It was their first ever event and it’s specifically for Shopify partners, not merchants as much per se but app developers, consultants, agencies, things like that. I’ve talked about it a little bit more on a different episode, so I won’t get into it too much here but overall I was really impressed with it. It was great to connect with a lot of people in the Shopify ecosystem, hear what was coming out in terms of new features. They had some announcements they revealed for the first time at Unite. It was a really, really well-produced, incredibly well-produced conference in my opinion. So if you can get into it, if you’re interested in Shopify, it was well worth the time. Drew: Sounds great. Next year I’ll have to check that one out. Andrew: Yeah, you definitely need to be there next year. Next one up is WooConf, so this is WooCommerce’s conference. Coming up real soon, April 6th through the 8th in Austin, Texas. Drew, you’re going and talking at that, right? Drew: I am, yeah. I’m excited about that. I don’t have much interactions with WooCommerce and I’m excited to learn more about it. Andrew: Are they paying you 10 or 15K for talking? Andrew: Fifteen K. Okay, perfect. Drew: First class flight and…yeah. Andrew: They’re going to hear from all these other speakers up in arms. Have you been before? Drew: Nope, I have not. I don’t know if they’ve even had it before. I think they have had it before actually. But they told me it was the number one e-commerce platform in terms of install base, and maybe because WordPress is 20% of the Internet. But I didn’t know it was that big. Andrew: Yeah, I saw some charts as well just using Google Trends and it was impressive, the amount of penetration they have in the market with install base. Drew: Right. Yeah, I’m excited to go. Andrew: This year we’ve got it coming up October 19th through the 21st. We’re doing it in Savannah, Georgia at a really cool old mansion. After last year, Drew…where you got lost in the bowels of the Gaylord for 48 hours, which is this enormous space…we really were looking for something much more intimate, so it’s at an old, upscale mansion that’s been turned into a hotel. It has about 125 rooms and a really intimate setting. Anyway live.ecommercefuel.com, something this year we’re going to be limiting to just community members. In the past, we’ve opened it up to other people, but that event, if you’re in the community or if you’re not and you’ll be joining, it’s a fun event every year. Of course, Drew, you spoke last year and I heard you got shafted on the speaking fee, which is a shame. Drew: Yeah, I did. But I loved the conference. I thought it was great. I wish you guys were around back when I had my small retailer because I just had this thirst for a community and that’s what you’ve got there. Andrew: It was fun. I look forward to it every year. Hopefully it will be a good time again. Next one, Practical Ecommerce’s conference, which I think they call Ignite. Dates to be announced for 2016, but it was in Dallas last year. Practical Ecommerce of course has a pretty well-known site online for e-commerce articles and information. Did you go to Ignite last year? Drew: No, I’ve never gone. Does anybody read Practical Ecommerce? Andrew: Yeah, I think people do. Drew: Yeah? All right, all right. Drew: Seemed a little old school. Andrew: Yeah, I think they’re a little old school. They’ve been around for quite awhile. But I know a handful of members went from the community and something to keep on the radar at least for 2016. Andrew:Prosper, the Prosper conference. This was a new one this year. They focus completely on Amazon. I had a chance to chat with a couple of the folks that ran it in San Francisco at the Unite conference. Andrew: I think it was February 8th and 9th, Salt Lake City. It was all on Amazon, completely focused on Amazon, and for the first time doing it, they had a great turn out. I think they had close to 800 or 1,000 members. I think they had something like 70 speakers. So if Amazon is something you’re looking to get into or really up your game at, that might be a conference to check out. Drew: That’s great. Just from speaking at conferences the past couple of years, it used to be all independent store owners and now it’s like 50-50 Amazon sellers and t-shirt affiliates. But the Amazon crowd is really…there is such a thirst for knowledge there. Andrew: Sellers Summit. This is an event put on by our good friend Steve Chou over at MyWifeQuitHerJob.com. Drew, you’re speaking at this this year. I’m speaking at it, it’s May 19th through the 21st in Miami. I think it’s sold out, but it should be a fun event to go to. Steve’s really trying to make it very action-focused, no rah rah rah, really more focused on actionable tactics. I’m looking forward to going and knowing Steve, I think it will be a great event. Drew: Yeah. I look forward to hanging out with you and with Steve at that conference. Eager to see what he puts together. Andrew: Yeah, it’ll be fun. If anyone’s heading to the conference, let Drew or myself know on Twitter. It would be good to meet up. So those are all the really specific ones for independent merchants. We’ll link up to all of the events as well as their URLs in the show notes. I want to move onto just conferences for generally in the space. Not e-commerce per se, but online marketing, networking, things that would be of interest otherwise. Andrew: The first one is South by Southwest. It happens in Austin, Texas. An enormous conference, music, tech and I think media this year. I think it’s just wrapping up March 11th through the 20th. Have you been there before? Andrew: It’s interesting. I’ve only been once and it was great to go. It was really interesting to go to once, but I don’t if it’s something I’d go to every year. It’s a great chance to network, it’s a great chance to hear some big-name speakers, hear some announcements. But it’s all over the place. If you want to go and…obviously not e-commerce specific per se, but I got the most value out of the networking and the fun factor and hearing about technology. Those were the big things for me and it’s huge. It’s expensive to go to because the whole city gets overrun. Rates for hotels and stuff just get astronomical. Fun to do once. I don’t know if I would do it every year. Drew: I don’t know, I feel like that would really stress me out, that conference because there’s just that manic energy of like, “Oh wow, Gary V. is talking here. We’ve gotta go see him,” “Oh, the Mixergy thing. We’ve gotta go,” and it just reminds me of this whole other world of entrepreneurship that I think I left when I was in San Francisco where it’s all about just getting funding and VCs are celebrities and Fundit startups are celebrity startups. I don’t like any of that and it just stresses me out so I don’t know if I would enjoy South by Southwest. Andrew: Yeah, definitely a different scene. Definitely a different scene from bootstrap entrepreneurs, but I’ll still make the case. It’s a little more hectic, a little crazier but probably worth experiencing at least once. ConversionXL Live. I think it’s actually going on right now as we’re recording this, March 30th through April 1st. And this is his second year I believe and I did not attend last year. I was hoping to. I wasn’t able to make it. But from what I’ve heard, it looks like a fantastic event. Drew: Cool. I didn’t even know he ran a conference. Andrew: Yeah, really actionable of course based on all around conversion rate optimization. But well worth looking into for next year if that’s something that you’re interested in improving on. MozCon, which is the event run by Moz, of course the SEO and inbound marketing agency. They hold this in the summer, I think it’s been in July. My notes here are saying September 12th through the 14th, so maybe they pushed it back a little bit, but it’s always in Seattle. It’s kind of got a broad…it’s SEO of course, but also I think they’re expanding beyond SEO to more marketing, in-bound marketing in general. Have you been? I’ve never been. Andrew: Another one I’ve thought about going to, but I haven’t pulled the trigger. But it looks like it’s one that I would like to get to at least once. The next one is MicroConf and this is, in the sense of bootstrapped and self-funded, very much more inline with I think a lot of people listening. You’ve been to a MicroConf, right? Drew: I have. I loved it. I really liked it. It was very focused on SaaS, so you don’t meet a lot of e-commerce people there. I think the attendees are mostly developers, SaaS developers, so a lot of the instruction and the talks are about who we would consider to be standard marketing stuff. But I just really like the energy and Rob Walling’s a smart guy and he always pulls together a good conference. It’s really inspiring. Andrew: Yeah. They do a U.S. version, which is coming up here again April 3rd through the 6th. Looks like springtime is conference season. Drew: Are you going to this one? Andrew: No, I’m not. Again this is another one I’d like to go to, but I’m not going this year. But the U.S. one is in Vegas in early April and a Europe one every year and I think it’s in late July, early August in Barcelona this year. Especially if you’re bootstrapped of course, but especially if you’re on the software side, worth doing. DCBKK. Dynamite Circle is the private community run by Dan and Ian over at the Tropical MBA and their annual big event is DCBKK in Bangkok. I’ve been to that. It was a great event and their community is focused on entrepreneurship and especially location independence and travel. If those things are interesting to you, fantastic community. Plus you get to go to Bangkok, which is always fun. Andrew:And then finally Traffic & Conversion Summit. This is Ryan Deiss’s event. It happens in February in San Diego. Have you been to this, Drew? Andrew: Really focused on a lot of tactical things in terms of funnel optimization and metrics and email marketing, things like that. Very tactically focused, I believe. Again speaking as someone who’s never been there, but from what I’ve heard. Another one I’d love to go to at least once. This one’s pretty big. I think thousands of people show up to this thing. Drew: Yeah, I suspect it’s a little sales-y, too, like Deiss may be trying to sell some of the Digital Marketer products. But maybe I could be wrong. It just seems like everybody’s probably got a program who’s on stage. If you’re listening to this podcast and I’m totally off, correct me. But that was my sense. Andrew: Yeah, we’ll have to go and judge it in person, but I think you might be right. Moving onto kind of the big ones, the slightly more enterprise-y e-conference style conferences, but I want to mention them. ChannelAdvisor Catalyst. This is another huge one. Early April in Vegas. You ever been to Catalyst at all, Drew? Andrew: No, never been there. ChannelAdvisor of course is the crazy, insane software that you can sign up for that helps you manage all of your inventory across all your different channels. It’s not something that I think is going to be in the budget or the best fit for a lot of people listening, but another big, massive e-commerce event that I just wanted to mention. ETail East or Retail Global, these are two different events. The first one’s in Boston in August, second one’s in Vegas in August. Have you been to either of those? Andrew: Okay. Myself, I haven’t either, but wanted to mention them there and link up to them at least. Shop.org Retail’s Digital Summit. This one looks interesting, one I’d kind of like to go to. I think they talk a lot obviously about…I think it’s tech-focused, but also retail in general. Drew, you been there? Drew: No, but the thing you gotta do…what I see a lot of people doing…is they alternate IRCE and Shop.org. So it’s like everybody’s going to IRC one year then everybody goes to Shop.org the next. Everybody being defined as Ezra Firestone. No, not Ezra Firestone. This is bigger retailers. Andrew: You’re getting all your event intro. We should have had Ezra on here to rip on you. Drew: Okay. I don’t think he’s ever been to Shop.org. Andrew: SMX East, Search Marketing Expo in New York. Drew, that’s right in your back yard. It’s in September. Andrew: You gotta have been to this one, right? Andrew: Oh, Drew. And then finally Shoptalk is in Vegas and that’s focused on tech, especially disruptive tech trends in e-commerce. I haven’t been to that one either. It’s in May but again I wanted to mention it and it would be a fun one to go to on the tech side. Drew: You could spend your whole year going to conferences. Andrew: You could, it’s tough. I feel bad, a lot of these…again apologies, I didn’t add a whole lot of value or insight into these bigger enterprise ones. But I wanted to put them on the record in case people were wondering. Drew: Do you recommend going to conferences? Andrew: That’s a good question. Yes, but I think you need to be really selective in the ones you go to. I’ll probably go to maybe two, maybe three a year. But the thing with conferences is it’s usually…by the time you travel, you disrupt your schedule, you travel, you go, you come back…usually they take the better part if not most of a week, which can be great. But it’s a pretty big expense both from largely a lost work perspective and how much work you’re not getting done in your business or otherwise and the expense of flying out there and staying in a hotel. So yeah, I think they’re valuable, but you’ve just got to be real careful about which ones you go to. Drew: Yeah. I think a couple a year would be probably my max if I were running a store. But it would also be my minimum. I would want to do a couple a year. Andrew: It’s good. It’s good to get out there. For me, the networking is always the best part. You think about the world we live in, there are some things you can definitely get at conferences that informationally wise and tactically wise, you can’t get online. But I think those are getting fewer and fewer. The big value, the whole reason I went to Unite…not the whole reason but a large reason I went…was to meet with a lot of the Shopify team I’ve connected with, to meet with Ed from Klaviyo. I’ve always wanted to meet him. He was going to be there along with a bunch of other people. There’s something magical about in-person relationships that is hard to duplicate online and it’s a great chance to connect with people. But we should follow up this at some point with an episode on how to really get the most out of conferences because yeah, you spend a week of time and a couple thousand bucks heading out, it’s nice to have a game plan for how to get the most out of it. Andrew: So are you going to be launching a conference here, Drew? Drew: There might be a Customer Analytics Summit located in New York City, probably in this office space where I am. Andrew: I don’t know, I like Nerdfest better than the Customer Analytics Summit. I think it’s got more of a ring to it. Andrew: Well, if you do Nerdfest, I will speak for $15,000. Drew: All right. It’s a deal. Andrew: Perfect. Drew, fun as always. Thanks, man. Andrew:You want to connect with and learn from other proven e-commerce entrepreneurs? Join us in the eCommerceFuel private community. It’s our tight-knit, vetted group for store owners with at least a quarter million dollars in annual sales. You can learn more and apply for membership at eCommerceFuel.com. Thanks so much to our podcast producer Laura Serino for all of her hard work in making this show possible and to you for tuning in. Thank you for listening. That’ll do it for this week, but looking forward to seeing you again next Friday. Hey! Andrew here with an addition after this podcast was recorded. My friend, a previous podcast co-host and eCommerce expert Ezra Firestone is hosting his eCommerce All-Stars event on August 5th and 6th in San Diego, CA. If you’re not familiar with Ezra, he knows paid traffic – and particularly Facebook advertising – better than just about anyone. He also has an impressive track record of building seven and eight figure businesses and has put together a great list of speakers for the event. You can check out all the details of his event right here, I’m sure it will be well worth the trip.